North Branford’s Sydney Senerchia pitches against Seymour during last season’s Class M final action on June 10 in West Haven. The biggest mover in the GameTimeCT/Register Top 10 poll resides in North Branford, where the Thunderbirds not only leapt five spots from 10 to No. 5 but are cruising through their early season schedule with authority. North Branford has only gone seven innings once in its six wins, outscoring the opposition 74-1 so far this season. The Thunderbirds have taken the next step in Nick DeLizio’s four years at the helm, winning at least 22 games and the Shoreline Conference title each season. All phases of the game are clicking for the Thunderbirds, who are batting .428 as a team; seniors Olivia Hemstock and Danielle Ramada have combined for 24 RBIs. Junior Amy Raucci is batting .500 while sophomore Kayla Despres has settled into the catcher’s role. Much run support isn’t required with who is tossing pitches in the circle, though. It’s been a memorable week for ace Sydney Senerchia, who officially finalized her college plans by signing for St. Peters. Senerchia — who committed to the school last November — plays her AAU ball for the Connecticut Charmers and is off to a torrid start for North Branford. She’s yielded eight hits, one walk and zero runs while striking out 59 batters in 25 innings. Senerchia was a part-time pitcher as a sophomore and was in a platoon last year before seizing the position just in time for a deep postseason run. 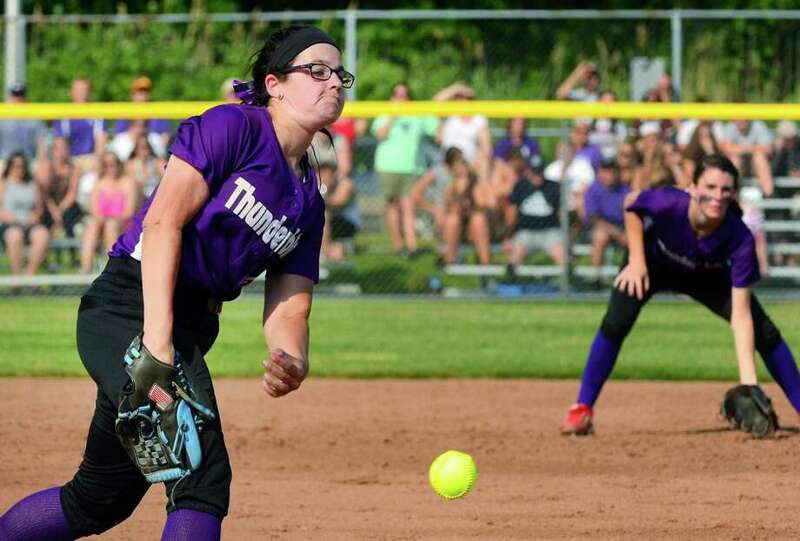 North Branford won its third straight Shoreline title before reaching the Class M final. The one-run loss to Seymour last June has fueled a fire for the returning Thunderbirds, who are out for the school’s first state championship. The Thunderbirds will face off against 5-0 Coginchaug on Monday. Defending champion Trumbull has established themselves as the team to beat in the conference again behind several routs of league foes. But the picture behind the Eagles is unclear as several schools have claimed key wins, only to drop others. Town rival St. Joseph is off to a 4-1 start, with the only blemish being a narrow 2-1 loss to Masuk on opening day. The Cadets have a bevy of bats that can do damage, including junior Kaitlyn Capobianco, who is hitting .571 through five games. Catherine Connell and Payton Doiron have split time in the circle. Danbury is perhaps the biggest surprise of the league so far as a pair of freshman hitting at the top of the lineup. Gianna Iaquinto and Trinadey Santiago have the Hatters out to a 5-2 mark. Ludlowe has also impressed — the Falcons have mashed the ball at points and earned a 5-4 win over the Hatters on Friday to move to 4-1. Norwalk, a strong preseason contender, is off to a 4-2 start. Trumbull, St. Joseph and Ludlowe are the only teams without a league loss. WATERTOWN AT WOLCOTT, 3:45 p.m., Monday: Battle between two teams that are off to a combined 9-1 start. CHESHIRE AT GUILFORD, 4 p.m. Monday: A rematch of last season’s SCC final, won 8-0 by the Rams. FITCH AT MASUK, 4 p.m. Tuesday: The Class L powers always seem to find on another in the postseason. SEYMOUR AT HOLY CROSS, 11:00 a.m. Thursday: The game that refuses to be played between the NVL rivals due to weather gets a third opportunity. TRUMBULL AT LUDLOWE, 4:15 p.m. Friday: Chance for Falcons to establish themselves as league contenders.